What on earth is a needle nucleus??? Well it is the shape of the nucleus in a sperm head. Yes, when studying this subject one can talk loudly about SPERM in coffee shops. Drosophila sperm are particularly unusual. They have very long tails. How long? VERY long. In many species, way longer than the actual body of the fly. Just google “Drosophila bifurca” for an extreme example. In Drosophila melanogaster, the sperm are almost as long as the male’s body, about 1.8mm. Blokes usually feel a bit uncomfortable thinking about this, but for flies, this appears to be an evolutionary strategy where sperm SIZE is traded against sperm NUMBER. Added to which, when females are mated, the sperm is stored in the female’s body, where individual spermatids will “compete” for numerous fertilization events, a mysterious process involving some female control, and modification of female behaviour by accessory proteins that get transferred along in the seminal fluids. Honestly I could talk about fly sperm all day, which can attract the wrong kind of attention. 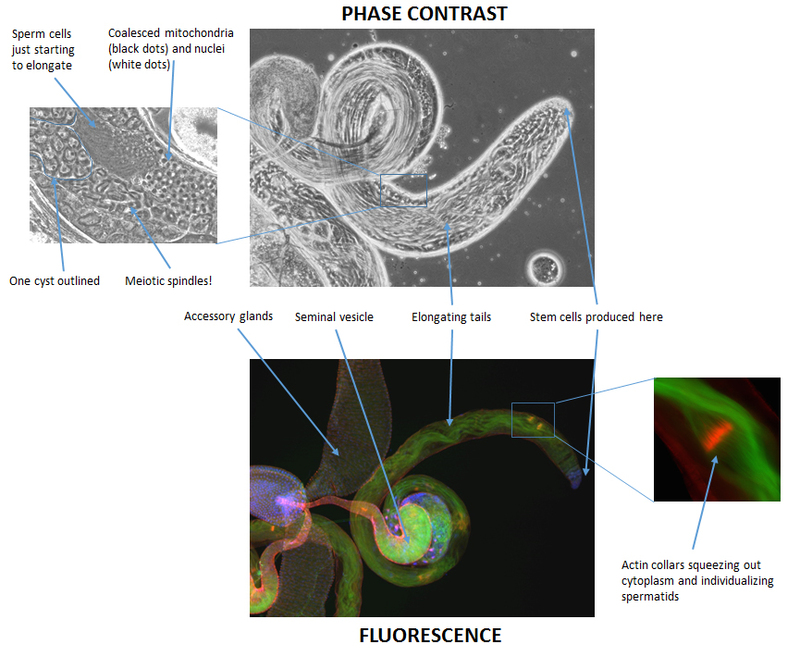 But here is some even more amazing stuff about fly sperm – how it develops. The sperm forms in the testes, no surprise there. In flies, the testes are very long, coiled structures held inside the body. At the anterior tip, there is a little niche of stem cells, and every time one divides into two, one daughter cell remains in the stem cell niche, while the other undergoes four mitoses, leading to 2/\4 or 16 cells, but all the cells in the group remain attached to each other by cytoplasm, and the collection is housed in a cyst. If you look at the testes under the microscope, you can see groups of cysts containing the cells in different stages of development. Eventually the sixteen early sperm cells (called spermatagonia which sounds like a far off and enchanted place) undergo meiosis (they are gametes, after all), so the cyst at this point contains 16 X 4 or 64 cells. This is a very cool stage where if you are lucky you can actually see the spindles of the dividing cells. Then a yet more remarkable thing happens – the cells start to elongate very dramatically. First all the mitochondria coalesce into structures that look like another nucleus under the scope, and collars of actin form at the base of the nucleus. Then the actin collars squeeze the cytoplasm down the elongating tail, with the mitochondria right along behind, so that at the end, that single celled blob right up at the top of the testis is now a very, very long but still single cell, with the heads of the sperm near the base of the testis and the bundled tails trailing tidily all the way back to the top. 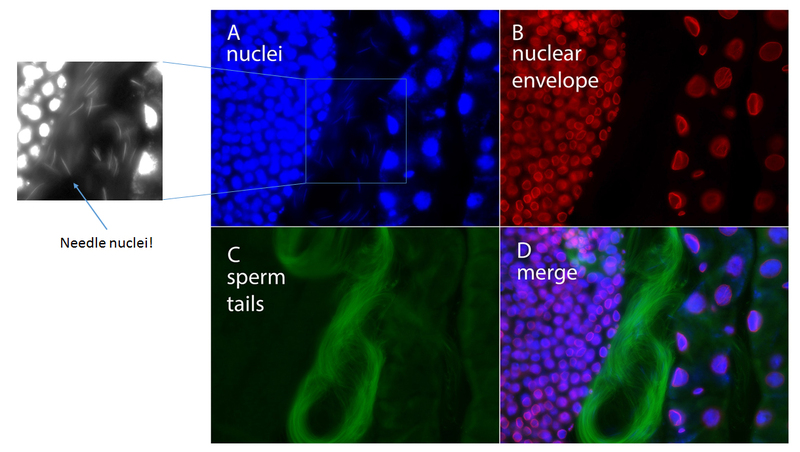 A remarkable set of morphogenetic changes in one cell. The nucleus of each sperm cell also undergoes a tremendous change. It becomes long and thin, looks exactly like a needle under the scope when stained with DAPI to label the DNA. The genome packaging in sperm is about as compressed as it can possibly be – even histones are a problem and they get chucked and replaced with protamines – ancient histone-like proteins that are conserved across taxa, a universal (?) sperm chromatin protein.